Tom Cruise (Image via RottenTomatoes.com)Tom Cruise is back in yet another action-pack movie, Mission Impossible 4: Ghost Protocol, the latest among the series of Mission Impossible movies. Cruise plays Ethan Hunt, an agent of IMF and with his team, they tried to stop a nuclear extremist from igniting the war between the United States and Russia. I watched the film in IMAX here in SM Cebu and my verdict: so so story but impressive stunts and panoramic scenes. I particularly enjoyed the scene when Ethan Hunt climbed the Burj Khalifa, the tallest building in the world located in Dubai. Using just a pair of gecko-like gloves, the suspense is at its climax when at many instances, Hunt almost fell out. I also appreciate the sound effect that kept my adrenaline level at high. Several explosions caught me off-guard and I actually shook in my seat. The IMAX surround sound was outstanding and impressively complemented the movie action pack plot. Image via Wikipedia Proclamation No. 298 signed by Executive Secretary Pacquito Ochoa Jr declares Thursday, December 8, 2011 as a special non-working holiday in the City of Taguig. The Proclamation states that the declaration will allow Taguig residents to celebrate the Foundation Day of Taguig City along with appropriate ceremonies. Those who will be required to report for work on that date shall receive appropriate compensation based on existing Labor Rules set by the Department of Labor and Employment. For consumers, the more options they have, the better. Now, here's a great news on that topic. The popular smartphone from Apple, the latest version of which is the iPhone 4S will be heading to the two largest networks in the country - Globe and SMART. Yesterday, Globe announced that the reservation for an iPhone 4S has begun. 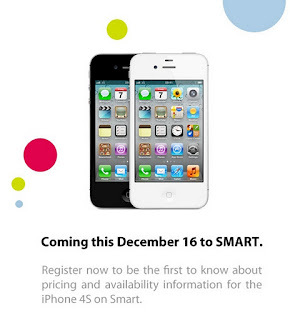 And now, after a day, SMART announced that iPhone 4S will be coming to them as well on December 16 and reservations has already started.